Once again Filipino creativity and ingenuity was showcased on the world stage when leaders of the Asia-Pacific Economic Cooperation (APEC) and their spouses donned them for a formal dinner. The Barong Tagalogs worn had a different kind of shimmer to it as they were made of a unique combination of Aklan Piña and Negros Island silk. Designed by renowned Filipino fashion designer Paul Cabral, the heads of state who wore the pina and silk fabric were United States President Barack Obama, Mexican President Enrique Pena Nieto, Canadian Prime Minister Justin Trudeau, among others. Most of the materials consisting of Aklan piña fiber came from Kalibo, Aklan. In Aklan, piña weaving is an age-old tradition handed down from generation to generation. Fiber is extracted from the leaves of native pineapple, with each strand painstakingly knotted by hand and woven manually. While most barongs are made of full piña fiber, this special APEC barong fabric was mixed with Negros Island silk. Without much fanfare, it was on Japan's Prime Minister Shinzo Abe and his wife, Akie, who displayed pride in the Philippine national dress. In a commemorative photo posted on the Facebook page of the Prime Minister's Office of Japan on Thursday, Prime Minister Abe, and his wife Akie were seen smiling with US President Barack Obama, seated next to each other at the round table at the SM Mall of Asia Arena Wednesday evening. 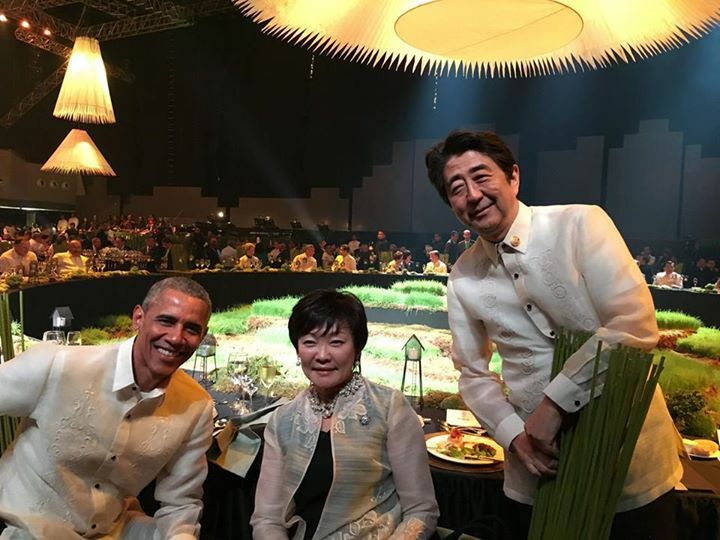 "At the dinner banquet hosted by President Aquino, President Obama, my wife, and I had a commemorative photo taken. 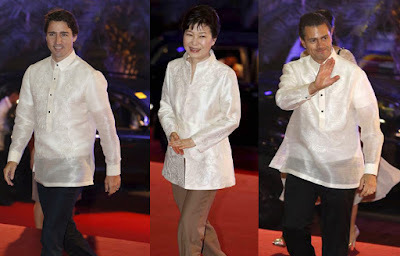 We are wearing Barong Tagalog, the ethnic costume of the Philippines," Abe said in a message that accompanied the post. 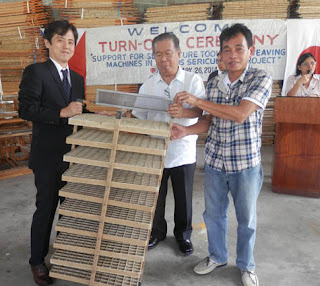 The silk from Negros Island is a product of the Silkworm Rearing Project in Bago City, less than hour south of Bacolod, managed by the Organization for Industrial, Spiritual and Cultural Advancement (OISCA)- International, an NGO founded and based in Japan but extends help to developing countries mostly in Asia and the Pacific with agriculture as its main thrust. Farmers from Bago and other neighboring towns rear silkworm whose cocoons are produced into silk yarns which are used as raw material for barong and other products. With the Negros Island silk complementing the Aklan Piña on a global stage, it won't be a surprise when the combined piña and silk "APEC signature fabric" comes into great demand from global designers too. Officials during the formal turnover of Sericulture Tools : Japanese Embassy's First Secretary Ryutaro Aoki, Governor of Negros Occidental Alfredo Marañon Jr. and Outstanding sericulture farmer Mr. Dennis Florentino last February 2014. Malcolm Conlan is a British Man with a Pinoy Heart. 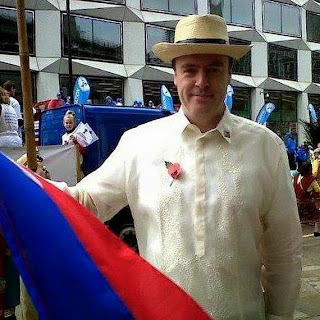 He loves wearing Barong Tagalogs.